Having a quick, beginner crochet pattern is wonderful for an afternoon project. I love to make things where I don’t have to think too much when I am watching television with the family. 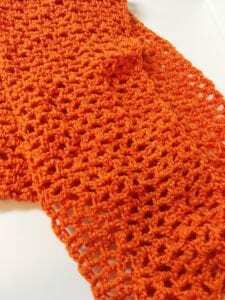 This Pretty Pumpkin Infinity Cowl is so pretty to wear in the fall season. This pumpkin color is all around our neighborhood right now. We have a few neighbors that grow a lot of pumpkins and sell them so they are all over their front yards. It is such a pretty sight. We also visited a corn maze a few weeks ago and there is a shop with pumpkins, squash, and gourds as decorations and for sale. Fall is such a beautiful time of the year. Of course, I think that scarves and cowls look so much dressier with a brooch. 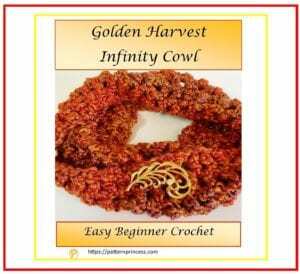 Here are two that I think would look fabulous with this Pumpkin Infinity Cowl. This Fall Leaf Pin would be just beautiful worn with this cowl. 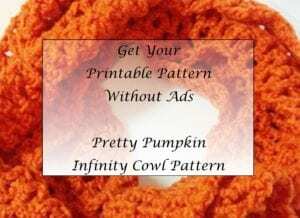 A Pumpkin Brooch for a Pumpkin Infinity Cowl. Row 2: Turn, CH 4, insert hook into the previous row CH 1 space (not the stitch itself, the space between the two DC from the previous row) , YO draw through the yarn and complete a DC. *CH 1, insert hook into previous row CH 1 SP, YO draw through the yearn and complete a DC*. Repeat from * until the last ST ending with a DC. Rows 3 and on: continue to repeat row 2 until desired length.I made mine 65 inches in length. Joining: Align the ends of the cowl so that they are flat against each other, and aligned with each other. (make sure not to twist the cowl when aligning the ends). Using a yarn needle, weave the yarn back and forth through the Stitches of each side until the cowl is joined. Once complete, weave in the ends. 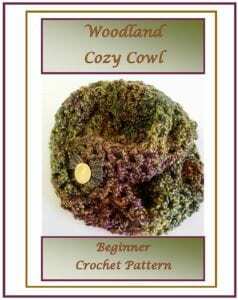 Here are a few crochet cowls you might be interested in.